While walking down the streets of Dubai, there’s one thought that always hovers on the fringe of consciousness – that superlatives are just not enough. The streetscape of the second-largest emirate in the Persian Gulf fires the imagination more than any other global city except perhaps Hong Kong and Shanghai. But more than the many ‘world records’ Dubai boasts for its gravity-defying structures, its futuristic constructions and surreal architecture make it one of the most jaw-dropping cityscapes in the world. As if savouring this fantastic mirage wasn’t enough, there are plenty of other reasons you want to visit this exciting, world-class city. Dubai is one of the world’s top international travel destinations, and with good reason as it presents endless opportunities for entertainment, shopping and lifestyle experiences. Its sunny beaches, indoor ski park, numerous bars, massive malls and mesmerizing souks draw tourists like a magnet, while the Arabian Desert with its stunning sunsets, camel rides, falconry and overnight desert safaris offer pleasures of an altogether different kind. 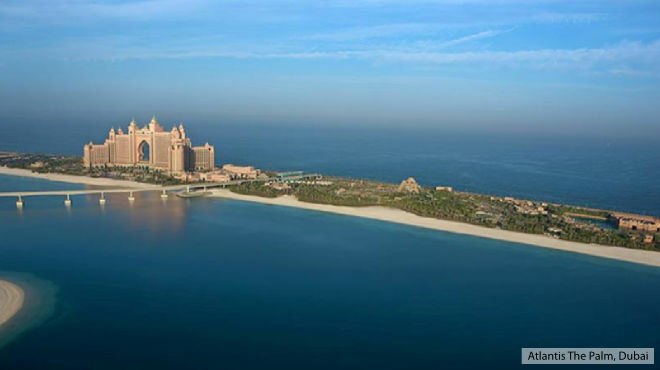 Located in the Persian Gulf, Dubai is one of the most exciting testaments to man’s imagination. You’re plum in the middle of a world-class tourist, shopping and lifestyle haven. Built on revenues from trade and oil, Dubai is one of the seven Gulf emirates and a modern-day, global business and financial centre. Burj Khalifa, Burj Al Arab, Jumeria Beach, Dubai Marina, Dubai Mall, Aquaventure Waterpark at Atlantis The Palm, Desert Safari.